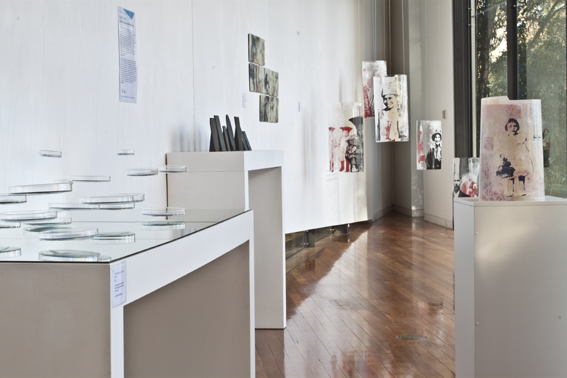 The Wagga Wagga Art Gallery is currently showing George Aslanis: Experiments in Light, a retrospective survey exhibition celebrating the practice of the loved and respected (late) artist/educator George Aslanis – former Head of the Glass and Ceramic Studio at Monash University, Melbourne. 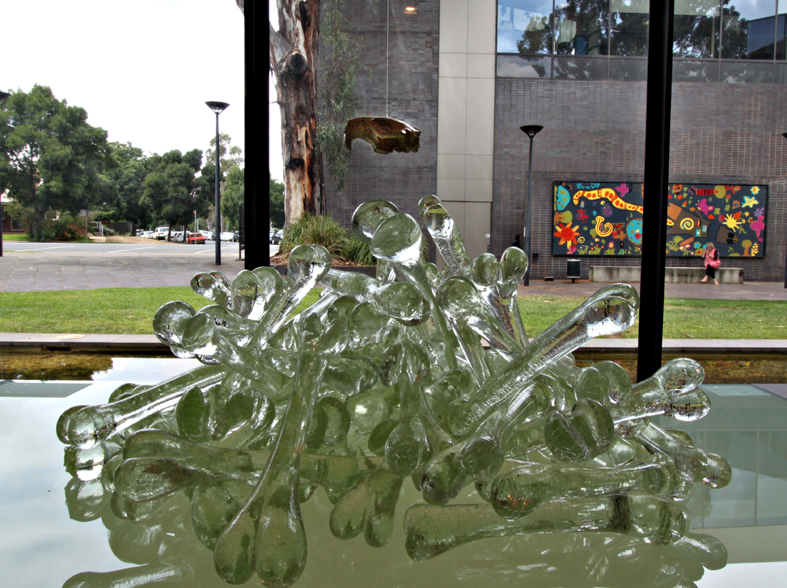 Wagga Wagga Art Gallery is proud to present a retrospective survey of one of the most influential and innovative artists in contemporary Australian glass, George Aslanis (1960-2016). Aslanis inspired a generation of glass artists to develop their passion and their understanding of the artform, and this new exhibition, George Aslanis: Experiments in Light reveals the great scope of his practice and his ideas. George Aslanis began his artistic career in ceramics, but became drawn to the paradoxical qualities of glass, which he described in one interview as “dense and heavy and solid… it is the antithesis of light, yet it describes light in so many ways”. 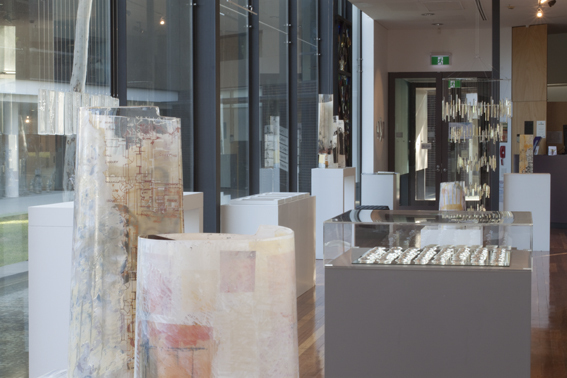 As head of the Glass and Ceramic Studio at Monash University for many years, Aslanis was a tremendous influence on glass students and artists across Australia, and many of the works on display in Experiments in Light have been loaned from former students. Aslanis’ practice involves a dialogue that describes ‘states of being’, and symbols and metaphors are important motifs in his work. 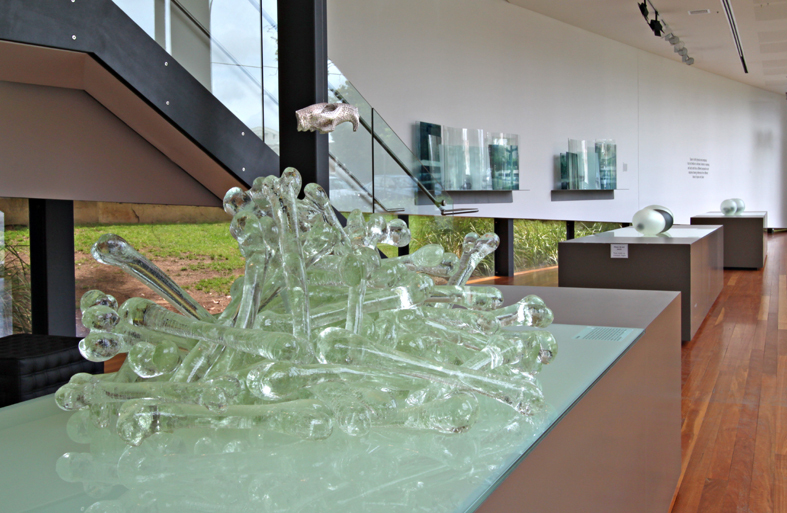 Drawing from cultures past and present he combined various elements to create visually complex cast glass sculptures. 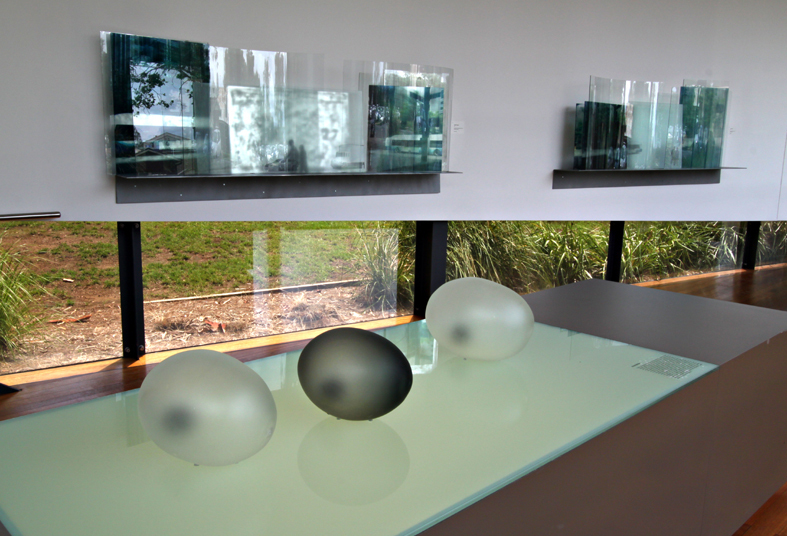 These objects are read from two sides, a sculpted textured surface and an open view into the interior space of the glass. The question of what exists beneath the surface, the interior life often unseen is a constant aspect of George Aslanis’ work. As well as his artistic practice and his influence as a teacher, George Aslanis was also known for his passion as a collector, with an exceptional eye for objects of art, craft and design. His later works combined his collections with his art, with installations that intermingled early Venetian glass vessels with found chunks of furnace glass, detritus from the casting process. 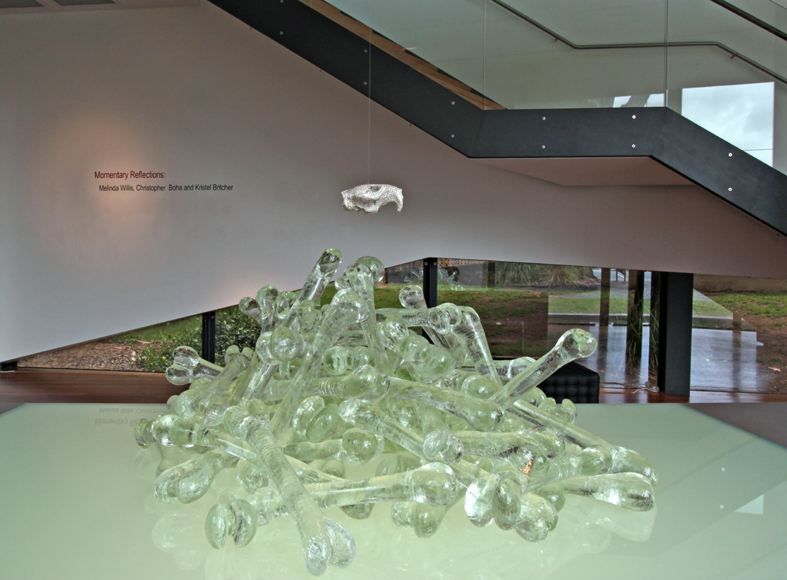 George Aslanis himself once described his work as “a discussion about glass, its inherent material properties; these include the sensual and the metaphorical. Glass is a material in a state of becoming, an endless multiplicity of potentials.” Experiments in Light is itself a tribute to Aslanis’ own multiplicity of potentials, and the home of the National Art Glass Collection is a fitting venue to reflect upon the life and career of such an influential artist. 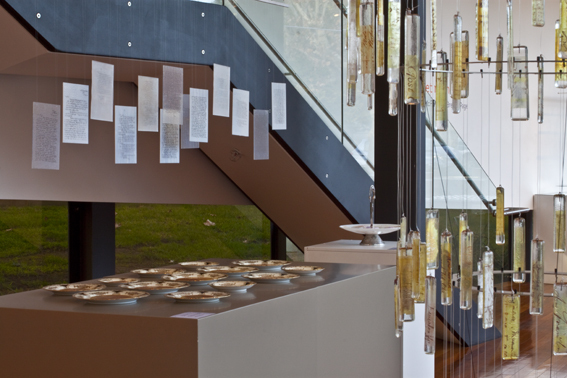 George Aslanis: Experiments in Light is on display in the National Art Glass Gallery at Wagga Wagga Art Gallery from Saturday 25 March until Sunday 9 July, 2017. An official closing for the exhibition will be held on Thursday 6 July at 6pm. This exhibition presents a collection of glass time capsules incorporating family heirlooms and personal items to illustrate ways we attempt to remember and preserve the past. My body of work looks at ways that people have tried to hold onto memories through the collection of letters, mementos, clothing, photographs, botanical specimens and ephemera. The thoughts and personal narratives evoked illustrate how lines from a letter, a faded photograph, piece of music or a fragment of fabric can trigger emotions and memories. When these are fused within glass the fragile qualities of the material allow these sentiments to be transformed into pieces which illustrate the delicate balance of life, relationships, memory, fragility and longing. The objects and images explore fragility, loss and transience through a collection of preserved and delicate items combined with glass and are not so much about remembrance rather than the act of not forgetting – ‘Forget Me Not’. My current body of work explores mourning and loss. This is not confined to the topic of death but encompasses losses we experience over a lifetime. I see our lives as a series of compartmentalised stages, a series of short stories that entwine and overlap. As one of these tales closes another opens, giving us an opportunity to reflect and mourn what has past and what will never be again. I want my work to have an emotional honesty, most times seemingly ambiguous but with that undefinable something that speaks to the heart of anyone who cares to engage in the stories told. My imagery and visual style is heavily influenced by Victorian aesthetics associated with mourning and death. I have chosen to use such a visual style to explore my concepts as it has a universal clarity about its intentions. 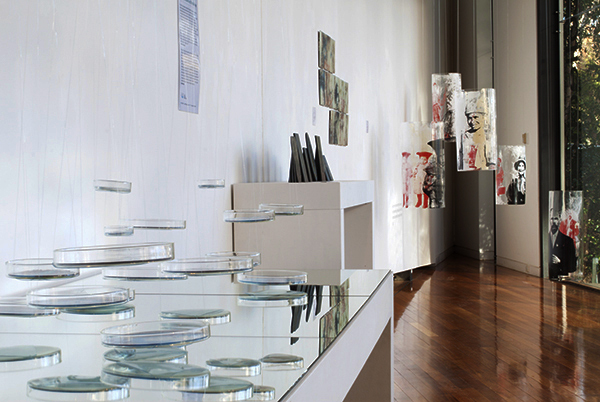 The use of glass underlines the narrative, speaking of fragility and simplicity. Get with the program, peeps – take a family drive. But we have to fess up that we’re really not sure whose work is whose, and it’s an indictment on art theoretic /so-called professional practice frankly that artists feel compelled to give such incredibly obtuse statements about their work that it’s a little confusing, without labelling, to figure out exactly which goes with what….more off-putting than connecting, let’s face it. And it’s all about communication, lovies…isn’t it? So in the end we’re left a little clue-less. That being said, bones and skulls always work for us, no contest. Perhaps it’s just that old renegade thang. 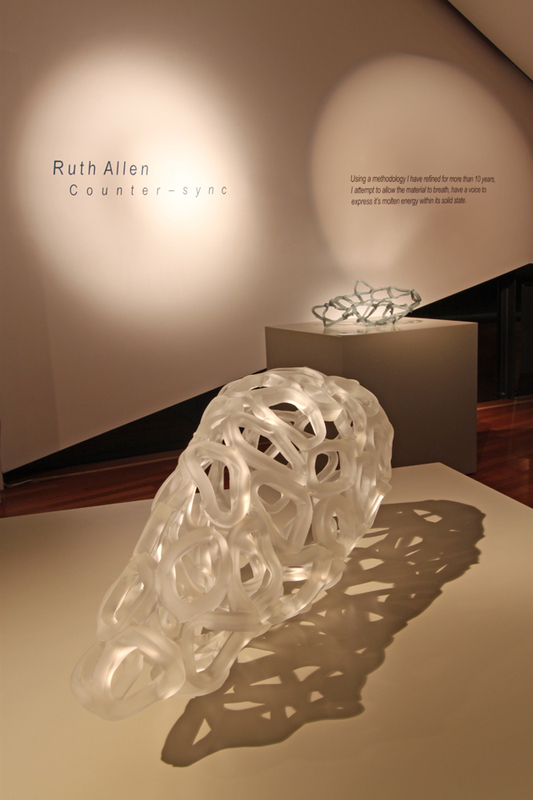 The cutting edge of contemporary glass comes to Wagga Wagga’s National Art Glass Gallery in Counter-sync, an exhibition of works designed and created by artist Ruth Allen as part of her Synergetic Series. 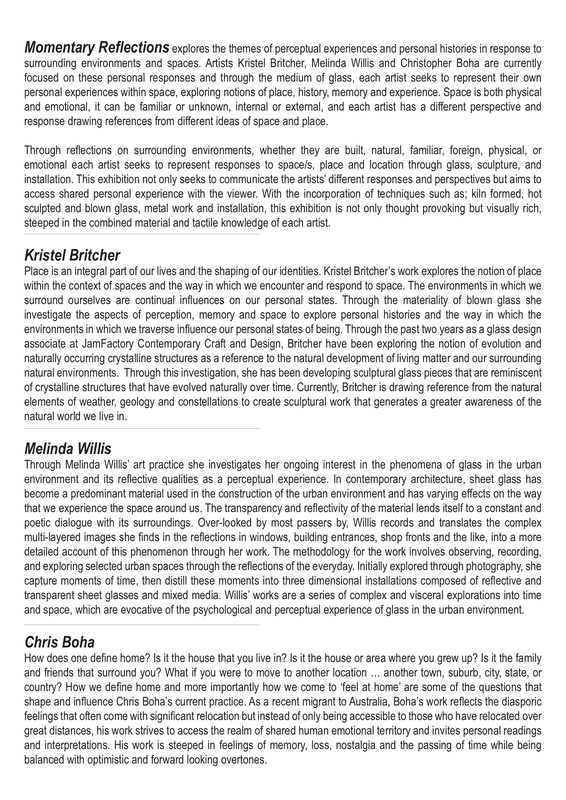 Allen has been developing methodologies unique to her synergetic expression since the year 2000; her relationship with the material glass is the catalyst for the design science of her ideas. 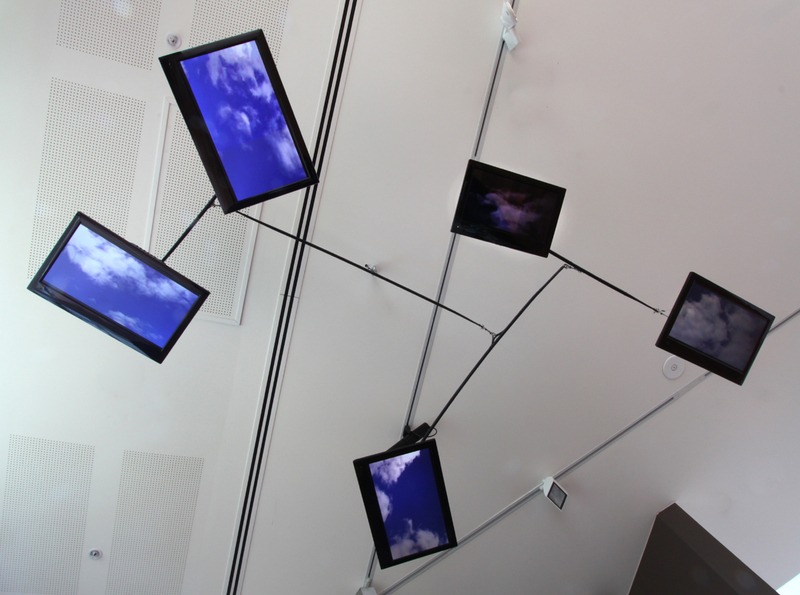 This symbolic relationship between maker and material, technique and process has allowed the physical idea to come to fruition. Focused research has nurtured the scientific, theoretical and conceptual contribution to the development of Ruth’s expression. 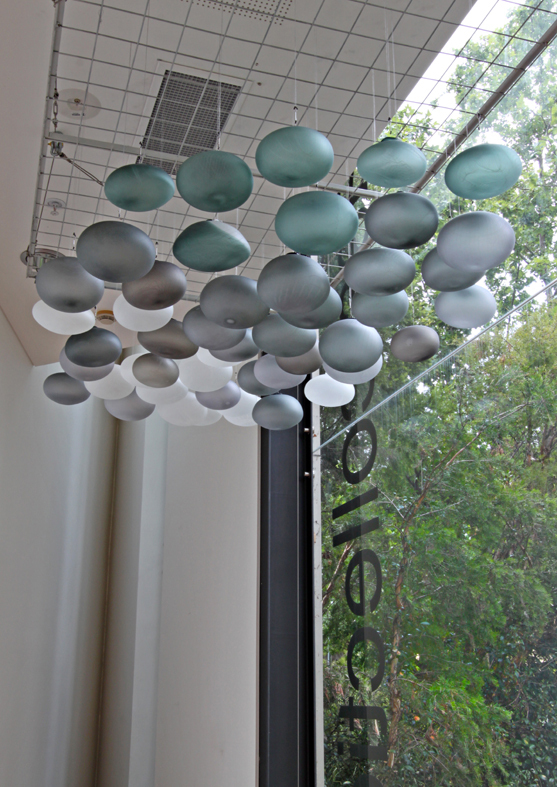 Allen says, “I strive to challenge perceptions of the potential of the medium; grounded in traditional hot glass techniques I choose to work sculpturally and often within an installation context”. The Synergetic Series is strongly influenced by the sustainable philosophies and designs of visionary thinker Buckminster Fuller, whose theory of Synergetics was an attempt to create a scientifically based poetics of experience. Fuller studied the inner geometries of the universe to design sustainable structures and cities, which focused on the synergy of the health of the planet, individuals and communities. Allen’s abstracted works resonate on many levels with the organic forms, cellular structures and postmodern architectural compositions that proliferate in our natural and built environments. Large scale installations of forms combine with lighting effects to bring the phenomena of shadow into play. 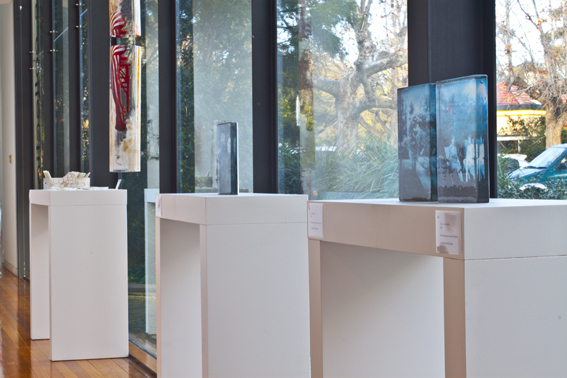 Counter-sync will be launched in the National Art Glass Gallery at Wagga Wagga Art Gallery on Friday, 23 November. 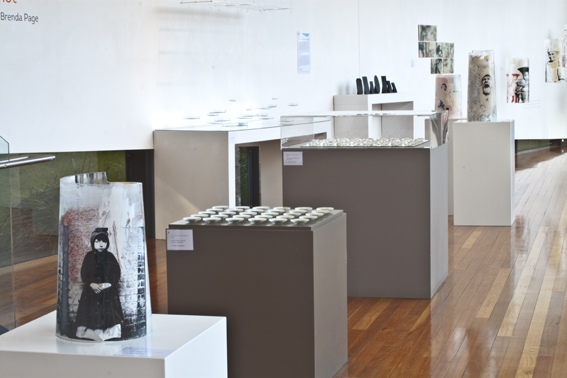 The exhibition will be on display until Sunday, 13 November. 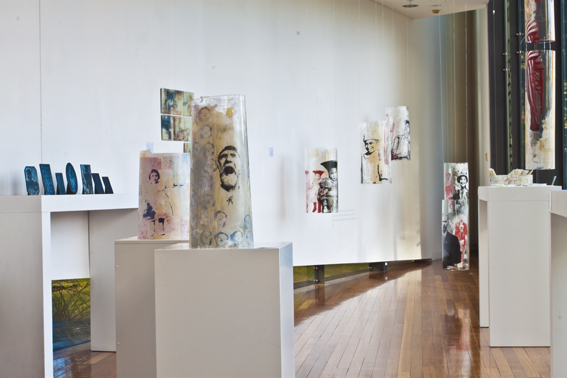 A Wagga Wagga Art Gallery Initiative. The Inaugural National Student Art Glass Prize was officially launched at the National Art Glass Gallery on Friday 12 March 2010, by Kay Hull Federal Member for the Riverina in front of patrons of the arts and members of the Australian Glass community. 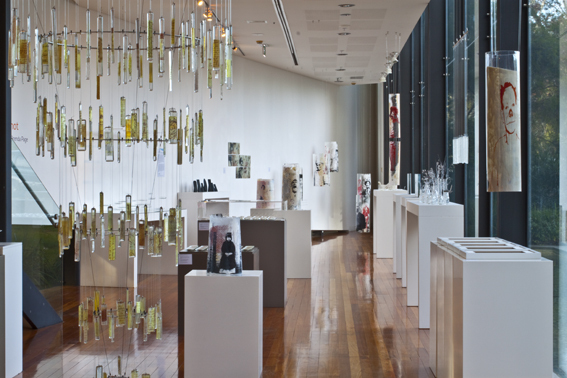 Wagga Wagga Art Gallery Glass Curator Michael Scarrone said he was “completely blown away by the support of the art glass community and Wagga Wagga City Council.” The student work in the exhibition ranged from beautiful, to thought provoking and technically challenging making choosing a winner a tough job for judges Maureen Williams, Barbara McConchie and Cath Bowdler. However CJ Taylor, Kristen Costello and Christopher Boha were awarded Highly Commended certificates. 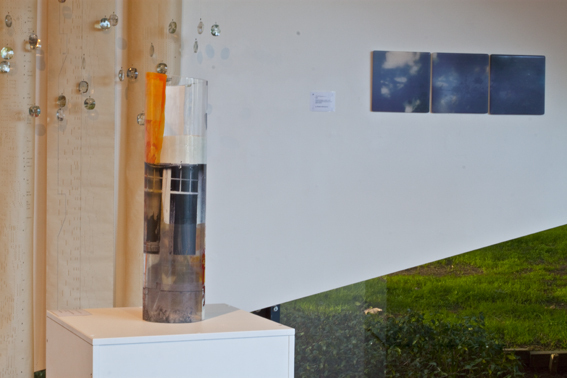 The winner of the inaugural National Student Art Glass Prize was Belinda Toll from ANU with her work Time contained, an exploration of the notion of memory. Toll will take up the prize of all expenses-paid masterclasses in the world renowned North Lands Creative Glass centre in Scotland later in the year.